Toothwort is a perennial plant that thrives is moist soils preferably in wooded areas. It is in the Brassicaceae family (mustard). This is a plant that is native to North America and is in the same family as the Cutleaf Toothwort (Cardamine concatenate). Distinguishing Features: Dentaria diphylla emerges in the spring and persists as a woodland groundcover throughout the summer. Three-lobed, scalloped leaves have prominent white veining. After flowering, plants go dormant for the summer, returning in fall when the trees begin to lose their leaves. Toothwort roots are tender, long, rhizomes (underground stems), and grow close to the top of the ground. Flowers: The flowers bloom in anywhere from late March to mid-April (sometimes later depending on weather conditions). 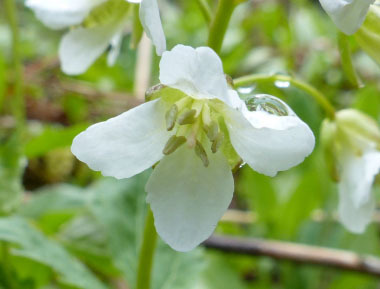 Theses flowers have four petals and are white to pinkish or light purple. The inflorescence is a loose cluster of long-stalked flowers. Fields of Nutrition has medicinal benefits and vitamin/mineral content of Toothwort. Leaves: Toothwort leaves are mostly compound lower leaves with a pair of toothed stem leaves each divided into three broad leaflets. Leaves are basal and they have a long petiole. 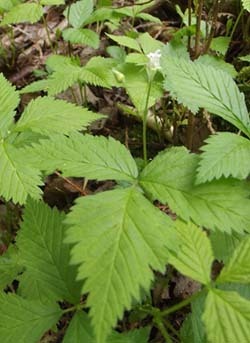 Height: This wild plant can grow between 20 and 40 centimetres tall. 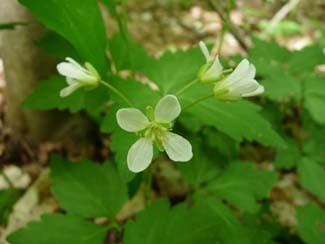 Habitat: Toothwort loves the rich moist soils in woods and in meadows. 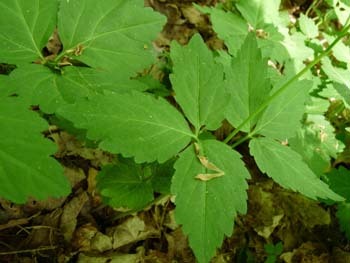 This plant grows primarily from Ontario to the Maritimes in Canada and primarily the northeast U.S. although it has been seen as far south as northern Georgia. 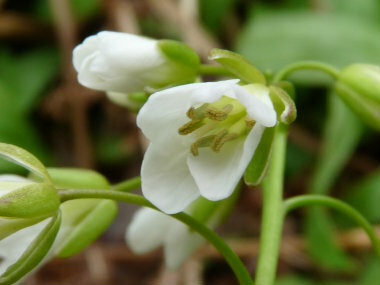 Edible parts: The leaves and roots of the toothwort are edible. They can be eaten raw or cooked. Leaves can be added to salads or tossed into soups. The root can also be eaten raw or cooked. It has a crisp texture and a pleasant (somewhat) pungent taste. It can be added to salads or used as a relish. The root has a pungent acrid taste when first harvested; many Natives cleaned the roots, placed them on a blanket and covered them; then they left them to ferment for 4 - 5 days. Apparently after doing this, the roots developed a sweet taste. Fresh roots have a crisp texture that tastes somewhat hot and peppery and can be used to make horseradish.